Why advertise in the Newsletter? The Kinross Newsletter has been a trusted part of the Kinross-shire community since 1977. We sell over 2,000 copies each month, and the readership goes well beyond that number. Unlike free publications that are put through letterboxes, you can be sure that every copy of the Newsletter sold is being read. Well over half of the Newsletter consists of news, reports by local organisations, articles by local councillors, features, and information about local events. So the Newsletter is kept for the whole month, and referred to regularly, unlike a free publication which goes straight into the recycling bin after just a quick flick through! So your advert has much more chance of being seen in the Newsletter. Readers regard the Newsletter almost like a directory of local businesses, as well as their best source of community information. Our readership is the county of Kinross-shire, so as a local business advertising with us, you are reaching the very customers you want to reach, rather than wasting money on advertising in publications going further afield. And if that isn´t reason enough, advertising with us is a great way of supporting the community. Business advertising allows the Newsletter to publish all the reports of the dozens of great community and sports groups in Kinross-shire free. Without you, they wouldn´t thrive as they do! Any profits made by the Newsletter are given away to local good causes. The Newsletter has two categories of advert: Display Adverts and Typed Adverts. Several sizes of display adverts are available as shown in the chart below. As from summer 2018, the only display advert accepted in black & white is the Eighth of a Page size (60mm high x 86mm wide). This costs £14.70 per insertion based on a six calendar month run. Prices are per insertion but based on the understanding that advertisers commit to advertising for a block of six calendar months. One-off or shorter run adverts are charged at a higher rate. Advertisers may change their advert within the six-month period - just supply a fresh advert to our advertising manager. Advertisers are invoiced at the start of a six-month block. Our advertising blocks are April-September and October-March. 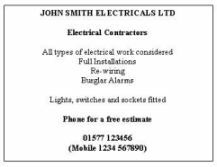 If you would like to place a Display Advert, please contact our advertising manager Julia Fulton, email: [email protected] or telephone 07936 151223. If supplying your own advert, please send as a JPG file. We can also accept PDF files, but please ensure that fonts are embedded. Thank you. Do you need someone to design your advert for you? The Newsletter is now offering a design service. Our in-house professional graphic designer can design your advert from as little as £20 for an eighth of a page size. Contact our Advertising Manager to find out more. As a guide, approximately eight words is the maximum that can be fitted on a line. Send all the above to our Advertising Manager by the normal monthly Newsletter deadline. If you wish to place a Typed Advert on a permanent or semi-permanent basis, contact our Advertising Manager to see if you can go on to our billing list. Click here for advertising terms and conditions. The Newsletter has a policy of restricting commercial advertising to businesses located in the Kinross-shire area. This is to support local businesses and to ensure that adverts are relevant to our readers. Our geographic area is electoral ward 8 of Perth & Kinross Council (the county of Kinross-shire and Glenfarg) plus a few settlements outside this boundary. 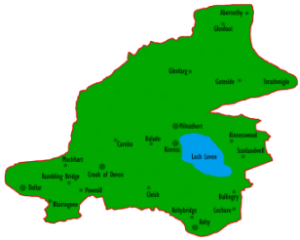 Settlements outwith Kinross-shire that we do allow advertising from are: Abernethy, Strathmiglo, Ballingry, Lochore, Kelty and Dollar. See map for a drawing of the areas included. The Newsletter does contain some adverts from outwith this area. Some of these are very longstanding adverts that have been in the Newsletter since before the Geographic Area policy was introduced. The Newsletter will consider adverts from businesses outwith the Geographic Area if they provide goods or services not currently advertised in the Newsletter by a local business. The Newsletter reserves the right to refuse adverts.